Enza and Vittorio live in Caserta, known as Italy’s Versailles, on the top floor of a small building. An open space, consisting of a kitchen, dining room and living room, takes up most of the 140 square metres of this flat. 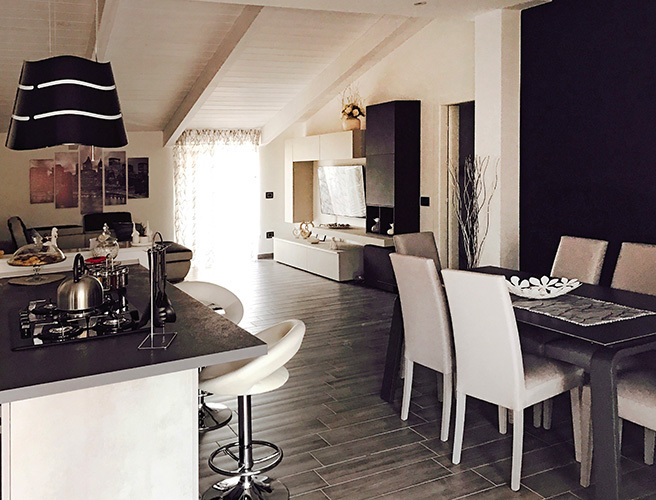 Although the natural lighting is rather poor, the exposed beams painted in white enamel and the white and pearl grey furnishings make the entire living room brighter and more spacious. "When they contacted me, Enza and Vittorio already knew what they wanted," says interior designer and architect Alessandra Iacullo. "Their intention was to create a clear and distinctive atmosphere by only using basic colours, such as black, grey and white. I just gave them a few tips, the rest was entirely their own design, including the final result." "First of all, we thought of a fireplace to reduce costs," says Enza. "Heating up the whole house with a gas boiler was becoming very expensive for us. Winters are generally mild here, but sometimes it can get really cold." According to the initial project, there was supposed to be a large painting on the main wall in the living room. The cladding, made entirely of slate, is not too even or dull. Instead, the natural grain of the stone is enhanced by the light effects created by the spotlights and the flame and gives it a truly unique sculpturesque effect. To keep the wall looking clean at all times, a pellet-loading panel was created at the back, where there is a small utility room also used for laundry. This is an ideal solution also in practical terms, since we can fill up the tank without staining anything or taking up extra space in the living room. 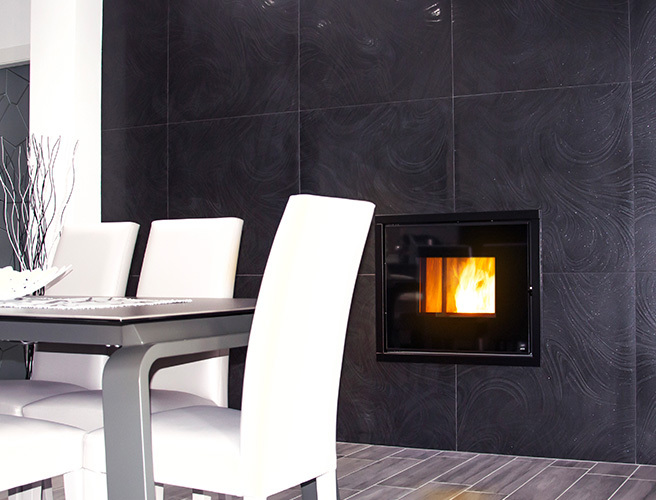 "It was our retailer, Il Focolare, who suggested an hydro pellet fireplace," says Enza. Enza and Vittorio said their hydro fireplace - the model Vivo 80 Hydro by MCZ - heats up all the radiators in the house on its own. It is very easy to use with a remote control or even via a text message directly from a mobile phone. 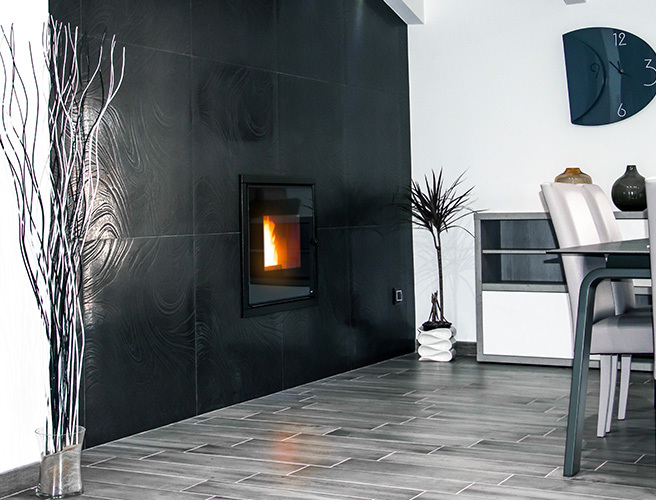 According to the retailer’s initial estimate, the fireplace is intended to run for about 6 hours a day for 4 months a year, approximately using up 70 bags a year with a total cost of 270-300 euros each season. However, because of the excellent insulation of the house, the actual consumption is considerably lower. By using high quality pellets, as suggested by the retailer, there are very few ash residues. It only takes a few minutes to remove the ash from the brazier and clean the glass with some kitchen paper. The result is a perfectly visible flame at all times. For Enza, her grandmother’s fireplace is now a distant memory.